White, Recycled Tissue Paper, 15" x 20"
Natural Kraft, Recycled Tissue Paper, 15" x 20"
Natural Kraft, Recycled Tissue Paper, 20" x 30"
White, Recycled Tissue Paper, 20" x 30"
White, Recycled Tissue Paper, 18" x 24"
White, Recycled Tissue Paper, 18" x 27"
White, Recycled Tissue Paper, 24" x 36"
Newsprint, Kraft Recycled Tissue Paper, 24" x 36"
Newsprint, Kraft Recycled Tissue Paper, 20" x 30"
American Retail Supply has been serving retail customers with tissue paper, gift wrapping & packaging supply needs since 1970. We have partnered with North American manufacturers for local needs of the retail market. We supply different types of retail stores such as apparel stores, gift stores, jewelry stores, shoe stores, sporting goods store and many more with pre printed tissue paper, colored tissue paper and plain brown and white tissue paper. The recycled kraft and white tissue paper are made with 50% Post-Industrial waste, 10% post consumer waste, and 40% virgin fiber. 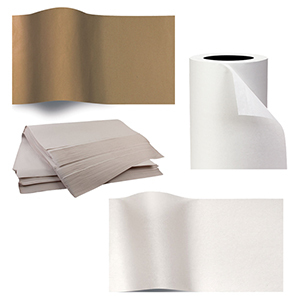 They are one of the best quality brown and white tissue paper available in the market. The top seller 10 lbs paper weight white tissue paper comes in two cut sizes 20” x 30” and 20” x 15” in 480 sheets per ream. The tissue paper is great for wrapping gifts, clothes, ornaments, decoratives, apparel accessories etc. The white tissue paper also comes in sheets of other sizes 24” x 36”, 24” x 18”, 18” x 27” and 24” wide tissue roll of 5200 ft. length. We also supply 20” x 30”, 12 lbs paper weight, newsprint, kraft tissue paper in 2300 sheets per pack. You can add your store logo and customize the brown kraft tissue paper or white tissue paper. You can print your brand logo or store name scattered all over the sheet or print the artwork centered on the tissue paper sheet. Our sales team has helped thousands of retail stores to get exactly what they need for their store needs, whether it any tissue paper thickness or deciding the exact shade of their store logo they are looking to imprint on the store packaging. American Retail Supply offer not only brown or white tissue paper but also different color shades of colored tissue paper, printed tissue paper ranging from simple stripes tissue paper to western style tissue paper to embossed gift tissue paper. You will find over 200 styles of tissue paper just listed on our website and we have additional hundreds of other tissue paper designs that we can send you when you speak with our sales representatives. Call us if you have any questions or need assistance in placing an order 1-800-426-5708. Made in the U.S.A. Order Tissue by the package. Package sizes are two reams of 480 sheets each. Sheet sizes are as marked.